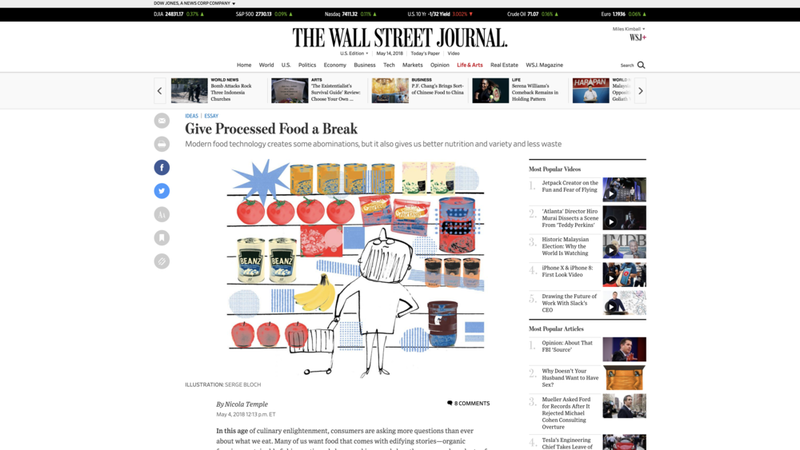 Link to the Amazon page for Nicola Temple's book "Best Before: The Evolution and Future of Processed Food"
In the Wall Street Journal teaser to her new book, "Best Before: The Evolution and Future of Processed Food," Nicola Temple argues (in line with the title the editors gave to her piece) that we should "Give Processed Food a Break." 1. Our earliest ancestors pounded otherwise inedible tubers with rocks and sliced meat with primitive tools—processing methods that are credited with beginning the trend in our evolution toward smaller teeth and jaws and bigger brains. We spend only 5% of our day chewing our food, while our closest primate relatives, chimpanzees, spend 37% of their day that way, according to a 2011 study. 2. The prevalence of diseases related to nutrient deficiency has led to the mandatory fortification of processed foods such as salt and wheat. 3. Now the quest for more sustainable sources of protein and more awareness of animal welfare are driving the effort to develop “clean meat”—lab-cultured protein that doesn’t require the slaughter of animals. 4. ... there’s a nutritional case for frozen food generally over fresh. Vegetables and fruit destined for flash freezing are picked when they’re ripe, while fresh produce is usually picked underripe and artificially ripened closer to the point of sale. Produce starts to degrade the moment it is picked, and the “fresh” peas or tomatoes that have been traveling for a week are often less good for you than their frozen versions. Nicola is certainly right that "food processing" can be either good or bad. But there are three reasons to be suspicious of food processing. More generally, if food becomes easier to eat physically, and instantly ready, you are more likely to eat it when it is otherwise a bad idea to eat it. The Newer the Type of Food Processing, the Less Tested It Is By Time. There are some silly ideas in the Paleo diet—for example, treating honey as a freebie, when it is unlikely that our distant ancestors got their hands on honey all that often. But I agree with the basic idea that what our ancestors ate has been tested by time in a way newer versions of food haven't been. Human beings are fundamentally omnivores, so a large variety of foods have been well-tested by many, many thousand years worth of consumption experience. Types of food processing that came into their own in the 20th century or more recently should also be suspect. Some we know reasonably well to be bad, such as the hydrogenation of oil that put transfats into margarine. But it is the 20th-century and more recent food-processing practices we don't know yet are bad that I am even more worried about. It often takes decades for research to establish that something is bad. And it often takes decades for people to get interested enough in the question of whether something is bad to begin that arduous process of research. For many, many types of food processing, the right view is that we simply don't know if it is safe or not. A particular thing might be fine or it might be terrible. A few decades of experience isn't enough for us to know. I am willing to take my chances with modest amounts of some processed foods that serve important purposes for me personally; basic Ranch dressing and Halo Top ice cream come to mind. But I don't pretend to myself that I know they are altogether safe. Food Companies Have a Different Objective Function Than You Do—Or at Least a Different Objective Function Than Your Long-Run Self Does. I have saved my biggest concern about food processing for last. With a little bit of exaggeration, I can say that food companies are maximizing against you. What is their objective? They want you to buy a lot of their food. That may involve being able to claim their food is healthy, but typically doesn't involve in any big way actually having the food be healthy. In addition to being able to make claims that their food is healthy, they want to make it tasty, quick and addictive. (To avoid argument, let me define "weakly addictive" as "even when you already have a lot of experience with the food, if you eat one, it will make you want to eat more, as when Lay's bragged about the weakly addictive quality of its potato chips, advertising "bet you can't eat just one.") Food companies also care about your willingness to pay a premium price and keeping the cost per unit down, but getting you to buy a lot of their food is pretty important to their success. Food companies are not your friend. They are in it for themselves. The more complex the food processing they have done, the more room there is to trick you in some way. Here let me make an analogy to consumer finance companies. When a financial product is very complex, with lots of fine print, it opens up more ways to trick you. There, the government can help, as I argue in "On the Consumer Financial Protection Bureau." Unfortunately, at this point, the government is much more ignorant about what is safe and unsafe in our diets than it is about what is safe or unsafe in consumer finance. So it is best to stay away from complex processed products as much as possible (or as much as personally tolerable). At a minimum, you should consciously think about how much you trust a particular food company before you eat complex processed food they have created. Conclusion. Particular types of food processing may be innocent, but in my view, any particular type of food processing should be considered guilty until proven innocent. Some types of food processing have passed such a trial. Many, many haven't.